"Anime often tends to be epic in scope, but it almost always explores its larger issues through the smaller, more personal focus of its chief characters. In the face of devastating wars, high stakes political subterfuge, the awakening sentience of artificial intelligences, rampaging demons and monsters, city-destroying psychic battles, or wholesale alien invasions, the characters' inner struggles remain at the heart of the story. Shogo plunges you into an epic crisis the outcome of which will affect the future of the entire human race, but it is the characters who drive the narrative and motivate your actions. You have allies that you grow to care about and enemies you come to despise." This article outlines the characters of Shogo: Mobile Armour Division. "Sanjuro and his brother Toshiro grew up in a military orphanage under the care of Admiral Nathaniel Akkaraju. During his early childhood, Sanjuro formed a close bond with Kura, the Admiral's daughter, that eventually blossomed into romance. Though Sanjuro became a highly respected commander in the UCASF, he was later held accountable for a tragic accident during a mission that left three of his squadmates-Toshiro, Kura, and his lifelong companion, Baku-missing in action and presumed dead. This tragedy not only damaged his career, but left him bitter and defeated. Admiral Akkaraju is offering Sanjuro one last chance to save his career and turn his life around. The mission: assassinate Gabriel. " The protagonist of the game, Sanjuro is a sarcastic, somewhat angsty U.C.A soldier (ranked at Commander) with a serious disrespect for authority, which earns him the ire of his commanding officer Admiral Akkaraju. He is still recovering emotionally from the death of his lover Kura, although that does not stop him from having a relationship with Kura's sister, Kathryn (explained in the opening monologue simply with the words "it's kinda complicated"). He was orphaned at a young age and he and his brother Toshiro were brought into a U.C.A military academy, where he met Kura, Kathryn, their father, and Baku. Sanjuro had the gift of fine social skills, leading him to be well liked by his class-mates. He had a special "love-hate" relationship with Kura as a young man, the two constantly teased each other in what was actually primitive flirting which eventually turned into full blown love. His lack of punctuality is a running gag throughout the game. After Toshiro, Baku, and Kura's supposed deaths he was diagnosed with post-traumatic stress disorder, in part due to some considering him responsible. He took consolation in Kathryn, which eventually lead them to love each other. At the end of Shogo he is left to deal with Kura and Kathryn, who are both competing for his affections, as well as presumably reacquaint himself with his brother and come to terms with the death of Hank. An older design document for Shogo had his last name as "Takeshi" and showed that the reason Sanjuro was the only one known to survive the terrorist attack was so that he could suffer through the emotional trauma caused by the event, as revenge for his assassination of the Fallen leader Ivan Isarevich. There is no evidence against this information in the final product, other than the change in last name, though no mention of it per say. "After her mother's death, Kathryn swore she would never use a weapon against another human being. So when everyone she cared about joined the UCASF as combat soldiers, she took a position as a communications expert aboard her father's star ship: the UCASF Flagship Leviathan. Her quick intellect and feisty willfulness have ruffled her superior officers' feathers from time to time-especially her father's-but her skill and relentless loyalty make her too valuable to lose. Following the tragedy on Cronus that killed her sister, Toshiro, and Baku, Kathryn and Sanjuro turned to each other for consolation. What began as comfort grew into love." The communications officer for the U.C.A.S.F Leviathan (listed as Lieutenant Commander), Kathryn is Sanjuro's primary radio contact as well as his girlfriend. She is responsible for giving Sanjuro most of his mission briefings and objectives over the radio. She seems more emotional and kind-hearted than her tougher, tomboyish sister, Kura. She like Sanjuro is described as someone who gets on the nerves of those of authority, but is too valuable to lose. She was voiced by Kathy Levin, who also voiced in Blood II: The Chosen. After the death of her mother in combat, she swore off violence. However, to keep with her training, family history, and friends she entered the U.C.A as a communications officer. After the supposed deaths of Toshiro, Baku, and Kura, she took comfort in Sanjuro as he did likewise, eventually growing into a romance. She is initially upset after finding out about Kura remaining alive, worried that it would mean that Sanjuro would leave her. She later apologizes for this to Sanjuro, but is still later infuriated with Kura after she makes a suggestive remark to Sanjuro. "The death of Nathaniel Akkaraju's wife marked the defining moment of his life. In refusing to abandon his post during a terrorist attack on the base where she was stationed, he cemented his reputation as a man of profound honor and earned the rank of Admiral, but he also alienated one of his daughters, Kura, who blamed him for the tragic consequence of his decision. Kathryn, his other daughter, defended him, knowing there was nothing he could have done. Admiral Akkaraju's grief over his wife's demise hardened his outward demeanor. He became a cold, ruthless disciplinarian, barely resembling the proud father and noble officer he once was." The leader of the U.C.A forces on Cronos (as an Admiral), and the father of Kathryn and Kura. The Admiral harbours a burning hatred for the Fallen, supposedly because of Kura's death at their hands. As it turns out, however, he knew perfectly well that Kura was alive and unharmed all the time. Thus, his harsh behaviour and ultimate decision to commit genocide against the people of Cronus is left somewhat unexplained by the plot, apart from his apparent dislike for insurgents, and perhaps also the effect of Ryo's poison tongue. After the death of his wife in combat previously, Nathaniel hid himself within his job, in part due to Kura blaming him for it. Due to his orders to take his ship, the U.C.A.S.F Leviathan, under military control despite orders from U.C.A High Command, he was put under court-martial in both Shogo endings. In the first ending, it is suggested that little would come of it with "no harm done", while in the other it is left ambiguous. He was voiced by the late Ted D'Arms, who also played Gideon in Blood II: The Chosen. "Hank's lifelong dreams of being a UCASF pilot ended when an uncorrected hereditary condition prevented him from passing the physical. Now he and his wife run a geothermal monitoring station for Andra Biomechanics in the abandoned city of Avernus. He's still looking for a chance to become a hero." A friend of Kura's, Hank is a citizen of Cronos who assists Sanjuro through much of the game before eventually being executed by Ryo Ishikawa. He had always wished to enter the U.C.A military as a pilot and become a "hero", however he never got past the physical tests. This was due to an untreated genetic condition that robbed him of much of his endurance. Instead, he married and worked as a geologic researcher (particularly geothermal studies) outside of Avernus for the Armacham Technology Corporation, all the while still wishing to fight. He met Kura in the underground during her stay as a U.C.A spy, and this friendship lead them to assist each other. He is the only major character to not have a Japanese-inspired name. An older Shogo design document elaborates on how he found Kura and how he got involved in the Cronian Revolution. While working as a geological researcher, he found the wrecked MCAs of a U.C.A. strike team and found Kura unconscious in her MCA. Hank took her to the base where he was stationed, and he and his wife attempted to nurse Kura back to health, while she suffered strange psychological afflictions. While Hank and his wife where discussing who tell to get her help, she regained consciousness and told them to reveal her continued life to no one. Over the next few months Kura recovered and made various unexplained trips into Avernus, and upon questioning Kura admitted that she was spying on the Fallen, to which Hank replied by demanding the she let him help her. There is no evidence against this information in the final product, though no direct mention of it per say save for a few lines of cut dialogue. "Baku was a scrawny underachiever who was often the target of bullies until he befriended Sanjuro and Toshiro in the military orphanage where they all grew up. Baku, too, loved Kura since their childhood days in the orphanage, but he never shared his true feelings with her." Sanjuro's childhood friend, Baku also vanished during the Fallen attack along with Kura and Toshiro. Baku became Gabriel's right hand minion Uziel, and holds an irrational hatred for Sanjuro. Baku was often beaten upon by his classmates as a child, partially due to his short stature and meek personality. Baku also grew a crush on Kura but never was brave enough to tell her, particularity after she entered into Sanjuro's affections. He is killed by Sanjuro in the first ending, while his future is left ambiguous in the second ending, though his mental state is questionable given Kura's quote of "Baku's insane, I don't know whats wrong with him, but he's dangerous." However, it might not actually be a permanent mental affliction but just an affectation of Cothineal's induced fervour. "Throughout her military career, Kura earned tremendous praise for her unequalled marksmanship, tactical brilliance, and perseverance. She managed her grief over her mother's death with the same unfaltering determination that distinguished her as a soldier. Her abiding anger at her father stems from the knowledge that she would have done the same thing in his position. After military school, Kura fell in love with Sanjuro, drawn to his whimsical, carefree approach to life, just as he was drawn to her self-mastery and resolve." Sanjuro's previous girlfriend, Kura (ranked at Commander) was assumed to have been killed in a Fallen terrorist attack several months before the events of the game. As it turns out, she is alive and well, having been investigating the Fallen as an undercover spy. Kura resurfaces midway through the game, revealing key information about the true nature of the Fallen to Sanjuro, and helping him in his mission. Rather then turn away from violence after her mother's death, as did her sister, Kura grew even more interested in a military life. She also blamed her father, who had held back from attempting to save his wife due to the need to follow command's orders. Kura saw this as cowardice that lead to her mother's death. Kura was dismayed to discover Sanjuro's relationship with Kathryn, feeling more angry at Kathryn than Sanjuro, or at least not to point of wanting "to kill [him]". The end cutscene depicts Kura and Kathryn angrily chasing after each other, presumably over Sanjuro. A description of the cancelled Shogo expansion pack Shugotenshi suggested that she was worse affected by the death of her friend Hank than the others, having had a longer relationship with him; she would have also been a playable character in the expansion. She was voiced by Kari McGee. In an older Shogo design document it is further elaborated about what happened to her during the terrorist attack and how she met Hank. While Cothineal took Toshiro to be her general, and got Baku to be Toshiro's right hand man, Kura was left to die in her MCA. Her loyalty and love of Sanjuro would have made her hard to manipulate and thus made her useless to the Fallen. She survived however, as Hank Johnson found the wrecked MCAs of the U.C.A. strike team and found Kura unconscious in her own mech. Hank took her to the geological research base where he was stationed, and he and his wife attempted to nurse Kura back to health. Although she had no major physical injuries, Cothineal's mental powers had left her deeply afflicted. While Hank and his wife where discussing who tell to get her help, she regained consciousness and told them to reveal her survival to no one. Even though they doubted her mental ability to decide on such matters, they honoured her wishes. Over the next few months, Kura overcame whatever demons were tormenting her and made various unexplained trips into Avernus. Upon questioning, Kura admitted that she was spying on the Fallen, to which Hank replied by demanding that she let him help her. There is no evidence against this information in the final product, though no direct mention of it per say save for cut dialogue from Hank. "Heir to the powerful Shogo Industries business empire, Ryo is shrewd and resourceful. His calculated cunning is matched only by his ruthlessness." The acting head of Shogo Industries' Cronus division, son of Shogo Industries' president Shinobu Ishikawa, and arguably the game's main antagonist. He is manipulating all sides in the conflict in an attempt to destroy the Fallen and all of the other factions so that he can exploit Cothineal. 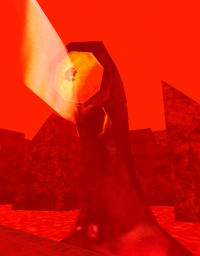 He is the final enemy fought in the game in both endings, though he is significantly easier than Gabriel in the second ending, as the player can take cover in Leviathan corridors while fighting his M.C.A (contrasting the rest of the game, where the MCA missions are typically easier than those on-foot). In the first ending, he can be dispatched, after defeating Gabriel, rather simply by concertinaing heavy fire on the entrance to the battle arena, annihilating the strike force he leads. An older Shogo design document elaborates upon Ryo's manipulations and motives. He immediately saw the Cronian Revolution as a chance for Shogo to gain control of kato mining. There were many groups with stakes on Cronus, some of which, such as Armacham and Andra, Ryo considered only minor threats, but he knew that he would still have to deal the with the UCA, CMC and the Fallen. After researching the situation on Cronus, Ryo met with Ivan Isaravich, who was the leader of the Fallen at the time. There they made a pact where in exchange for lessening the amount of kato mining, the Fallen's main objective, Shogo would become the sole distributor of the biological ore. Cothineal knew that Ryo would eventually betray the Fallen, and that his motives were only to make kato more scarce to drive up the price, but she figured that the short term benefits justified the alliance. Shogo started to supply the Fallen with information, weapons, resources and technology, all without any other group suspecting anything. Ryo was even clever enough to make sure that Shogo get raided by the Fallen just as much as anybody else to draw away suspicion. Ryo was furious when he heard that Isaravich had been assassinated by the UCA, so he found out who was responsible, Sanjuro, and plotted to make him suffer. This is why Sanjuro was left alive after his team was attacked by the Fallen, so he would have to face the mental demons caused by the traumatic incident. Gabriel, the new Fallen leader, then contacted Ryo and altered the deal. In response, Ryo then planned to gain control of Cronus' kato by capturing Cothineal directly and housing her in a stasis field generator on a space-based platform where they would test and exploit her. There is no evidence against this information in the final product, though no mention of it per say. "Deeply affected by the loss of his parents, Toshiro, Sanjuro's brother, was a sullen, withdrawn child who was more comfortable in his own highly active imagination than in the company of others. He envied Sanjuro's popularity and rugged self-assurance, but never became dangerously jealous until Sanjuro and Kura fell in love." Sanjuro's brother, who disappeared during a Fallen terrorist attack several months prior to the events of the game. It is revealed that Toshiro is in fact the Fallen leader, Gabriel. After the attack, he was captured and taken over by the Cothineal, becoming her human avatar. In childhood he was more affected by his parents' deaths than his younger brother, leading him to stay reclusive and prefer the company of his own imagination. This lead him to have a quiet and more thoughtful personality. He also grew jealous over his brother's popularity, heightening after Sanjuro and Kura fell in love. In the first ending it is depicted that Toshiro is removed from Cothineal forcefully and undergoes treatment for his experiences, while in the second it is told that he remains as Ambassador to Cothineal, presumably regaining more self-control. In an older design document for Shogo, it is shown that Cothineal herself staged the terrorist attack to draw the team containing Toshiro to the where she could manipulate him. He, like Ivan Isarevich, had a mind capable of handling Cothineal's orders and his emotional instability caused by his resentment of his brother made him easier to control. Cothineal took over Toshiro's mind with much more force than Isarevich as her cause was more desperate and the Fallen needed a leader. She sent him against his friends, taking on Baku as his right hand man and leaving Kura to die, as her loyalty to Sanjuro made her useless as a pawn. Sanjuro was only allowed to escape to allow him to suffer through the emotional trauma caused by the event, in vengeance for the death of Ivan Isarevich. There is no evidence against this information in the final product, though no mention of it per say. A colossal underground creature that is actually the source of Kato. She was responsible for the creation of the Fallen and the possession of Toshiro and Baku. In either ending, humanity negotiates with Cothineal, though in the second ending Cothineal is injured by Sanjuro while freeing Toshiro by force. Cothineal seems similar in design to The Ancient One, the final boss of Blood II: The Chosen, sharing a similar Lovecraftian appearance. Despite seemingly being the first intelligent extra-terrestrial life form ever encountered, the focus remains mostly on the fuel she outputs. An older Shogo design document elaborates more on Cothineal's past and activities during the Cronian Revolution. Ivan Isaravich, the Fallen leader, had a meeting with Ryo Ishikawa and they made a pact where in exchange for lessening the amount of kato mining, the Fallen's main objective, Shogo would become the sole distributor of the biological ore. Cothineal knew that Ryo would eventually betray the Fallen, and that his motives were only to make kato more scarce to drive up the price, but she figured that the short term benefits justified the alliance. Shogo started to supply the Fallen with information, weapons, resources and technology, all without any other group suspecting anything. After Isaravich was assassinated, Gabriel, the new Fallen leader, then contacted Ryo and changed the deal. So Ryo thought up a new plan and weakened the CMC by convincing or bribing officers to join his side. Having taken care of one foe, Ryo than planned to gain control of Cronus' kato by capturing Cothineal and housing her in a stasis field generator on a space-based platform where they would test and exploit her. There is no evidence against this information in the final product, though no mention of it per say. The pilot in charge of flying the Avenging Angel shuttle. He flies Sanjuro down to Cronus from the Leviathan early in the game. He is referred to merely as "pilot" in the game files. He might be named after Israel Evans, the LithTech motion capture actor and artist; later co-founded Sandlot Games alongside Daniel Bernstein and engineer Scott H. Pultz. A lieutenant serving under Sanjuro during a mission on Cronus taking place in the first level of the game, and most notably the evacuation off planet. He is referred to merely as "Shock Trooper" in the game's files, and is probably named after Mike Dussault, the head engineer of the LithTech engine. A former leader of the Fallen that was assassinated by Sanjuro, Toshiro, Baku and Kura during the mission where all but Sanjuro were supposedly lost. Ivan was described by Ryo dismissively as "an up and coming tyrant". After his death, Gabriel (aka Toshiro) took control of the Fallen. In an older design document for Shogo, Isarevich is described in more noble fashion as an environmentalist who was concerned that such a high rate of kato mining would eventually lead to its disappearance. He was charismatic, respected and had a strong enough mind to stand being controlled by Cothineal, the first person of the kind she found. Isarevich fervently campaigned to the CMC in order to lower the rate of mining to no avail. Eventually Cothineal gave him new orders, to form the Fallen and commence retributive terrorist attacks against the CMC. When the CMC tried to declare Cronus independent and the Cronian Revolution began, the Fallen were able to grow in strength. Ryo, trying to meddle in the conflict for his own ends, secretly met with Isarevich and fed the Fallen information, technology and resources. There is no direct evidence against this information in the final product, though there is no mention of it per say. A bartender on board the Leviathan, that Sanjuro attempts to gain a drink called the "Red Claw" from at two points in the game. She always refuses for one reason or another such as "you're on duty" or "I think you need a clear head". In the end cutscene, Sanjuro blows her up after she refuses to give him the drink yet again. However, whether or not this can be considered as canon is disputable. Kathryn: Aren't you forgetting your squad mates? Sanjuro: Actually, I'm ignoring them. It should be noted however that they arguably function better than Maurice and Toshi do later in the game. A young, blue-haired (or dark-haired, per anime convention) woman soldier fighting for the Fallen, Samantha attacks Sanjuro at several points in the game. Despite apparently being blown up each time, she somehow manages to return again to challenge him. She plays no significant role in the story, though some people claim that she is supposed to be Sanjuro's first girlfriend and so add a new dimension to the relationship - though this probably stems from people confusing her with Kura. She might have been voiced by Lynn Rott, who also voiced in Blood II: The Chosen. Head of the U.C.A.S.F's "Strike Force Carnivore", he leads a team against the Fallen inside the old C.M.C headquarters, assisting Sanjuro's mission. While Sanjuro is trying to escape the facility after the mission encounters complications, the Lieutenant and the entirety of Strike Force Carnivore is overwhelmed by the Fallen. Two friends of Hank's that assist Sanjuro inside MCA's when he enters Maritropa. 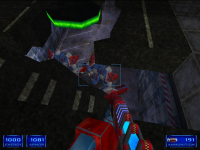 They are an early example of squad artificial intelligence in first-person shooters, but suffer from the problem of somewhat limited responsiveness that plagued this technique during the 1990s. This is shown by issues such as the player being able to easily outrun and lose them or, more notably in this case, them dying almost immediately after the level begins. In addition, they have been known to actually shoot Sanjuro if he happens to be in their line of fire. It should be noted however that arguably the squad mates shown earlier in the game function better. If they do manage to survive long enough, they will also be eventually unable to follow Sanjuro due to level obstructions, making their inevitable deaths seem as if they were intentional. About midway through the game, Sanjuro is stopped by an electric fence in the slums of Maritropa. It is controlled by the Haddam couple, and Sanjuro talks to Mrs. Haddam requesting she deactivate it. She agrees, but only if he finds her lost pet cat. If the player does this he enters an extra level where he must fight stragglers who wish to eat the cat, the other more grisly option being to kill her and then defeat her husband and forcefully destroy the electrical generator. This page was last edited on 29 November 2018, at 03:19.